It’s been over 50 years since Ford released the original 1965 (and subsequent ‘64 ½) Mustang. Not prepared for the ensuing press frenzy that would quickly put the Mustang on the map, Ford’s original Mustang sales had far exceeded any expectations. With over 400,000 Mustangs sold by the spring of 1965, Ford set an automotive industry record for most cars sold of any fledgling model in history. A true icon of the muscle car era, legendary racer Carroll Shelby was never one to shy away from breaking the mold of what a sports car should be. Building on the popularity of the highly sought-after 1964 ½ Ford Mustang, American Shelby (already known for their Shelby Cobra model which dominated the racing scene in the two years prior) quickly realized the unique opportunity to bring Ford’s Mustang into the racing world with one objective in mind: Create a modified performance Mustang that could not only compete, but actually win the storied SCCA championship. 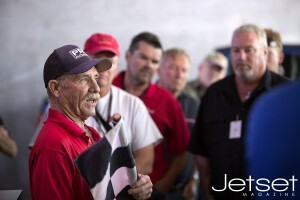 Not only did they take first place in the GT350’s very first race at Green Valley, they dominated B production SCCA racing for years, beating the Corvettes and Jaguar E-types in 1965, 1966, and 1967. Thus the story of Ford’s iconic GT350 began. Fast forward to 2016 and American Shelby’s team has once again taken Ford’s newly-remodeled Mustang over the top with a performance package unlike anything the public has seen from Ford in decades. Developed in collaboration with the team of engineers at Ford Performance (formerly SVT), the all-new GT350 Mustang offers more than just a slight performance upgrade. Picking up where the Boss 302 left off, the new Shelby GT350’s 5.2L naturally-aspirated (non-turbo, non-supercharged) V-8 engine produces an impressive 526 hp and 429 lb-ft of torque to deliver the raw power that traditional muscle car fanatics have grown to love. 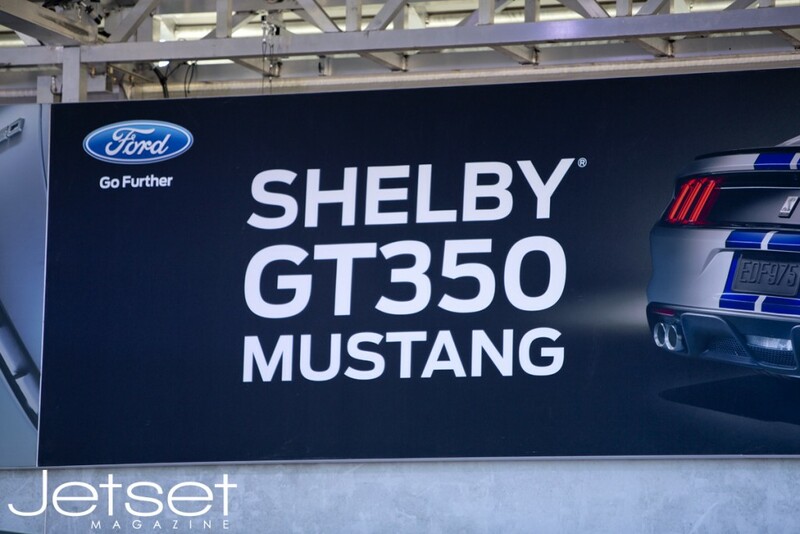 With a new TREMEC 6-speed manual transmission, Torsen rear differential with independent suspension, giant Brembo vented disc brakes, and extremely effective flat-plane crankshaft, the new and improved 2016 Shelby GT350 is not your average Mustang. They’ve even included an exhaust mode option which lets you turn up the growl of this roaring beast with the simple flick of a switch. Ford has released two versions of the new model. The base (a word I use very loosely here) GT350 and the lighter, two-seater version aptly named the GT350R. With carbon-fiber wheels and no back seat, the GT350R was designed for the track, while the standard GT350 still boasts the same engine and horsepower in a more street-friendly configuration. So what does this all translate to? One word: Performance. Okay, two words: Ford Performance! 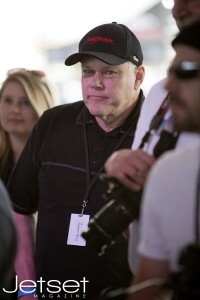 Barrett-Jackson’s CEO at the GT350 event. Geared up for the GT350 Track Tour! 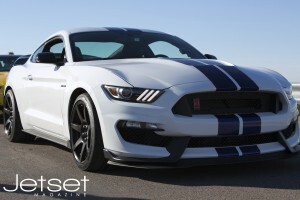 The GT350 North American Track Tour made its way out to Wild Horse Pass Motorsports Park in Arizona last month and Jetset was privileged enough to be invited to take the new ‘stang for a spin. The result was an informative and thrilling journey into Ford’s racing history coupled with a slight case of whiplash. Well, maybe the whiplash part is a slight exaggeration (they were pretty serious about getting everyone strapped in securely), but the experience was certainly one not to be forgotten. Red-lining at 8,250 RPMs and hitting speeds in excess of 100 mph, the Track Tour was the perfect opportunity to find out what the new GT350 was really made of. As if the rumble of the GT350’s performance exhaust system wasn’t enough, my pulse continued to elevate with each corner of the race track, as the tires stayed firmly gripped to the asphalt. A quick hot lap with one of the event’s pro drivers served to only further increase my enthusiasm for the new model. And while Ford has yet to release any official numbers, I can tell you first-hand that a 0-60 time of under 5 seconds is definitely included with the purchase of this modern muscle car. 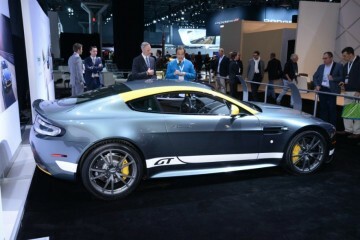 Affluent car collectors have many options available to them. And while I would never dissuade anyone from purchasing one of the finest that German or Italian carmakers have to offer, no garage is complete without one piece of unbridled, unapologetic American muscle. The only real question is which color scheme to select….